Magic Jump Rentals has provided party rental service in the Los Angeles county area since 1995. We have grown to be one of the biggest and most reliable inflatable rentals company around. MJR offers a large variety of jumpers, bouncers, combos, water slides, obstacle courses, slides, interactive inflatables, concession machines, and other games. We continually look to add new and innovative inflatable units to our rentals. All of our inflatable units are fairly new and cleaned after every use. All of Magic Jump Rentals inflatable units meet the latest standards for safety in design and operation. Magic Jump Rentals provides an easy and convenient method for online rental, all it takes is 3 easy steps to rent from us. Magic Jump Rentals thrives on its excellent customer service and timeliness so customers can enjoy their party without having to worry about their order. Magic Jump Rentals has provided inflatable rentals service to all occasions, such as house party, school party, carnivals, business events, birthday party, block party, city events, day care centers, anniversaries, weddings, picnic party, park events, etc. 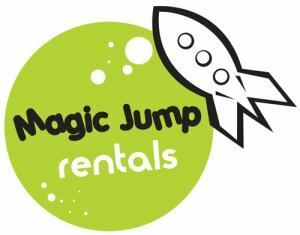 Why choose Magic Jump Rentals? Because we are devoted to providing our customers with the best quality service along with the safest, cleanest, and newest products that will make any event an unforgettable one. Our special packages include great discounts, and are designed to provide the utmost excitement whatever the occasion may be. This place is great! We booked our magic jump through Magic Jump's website without any problems. The price quoted online was exactly what we paid, i.e., no hidden fees. The price included delivery and set-up. We paid $85 for a magic jump, scheduled from 12-8. To our pleasant surprise, the Magic Jump guys delivered our magic jump one hour early. ONE HOUR FREE-YAY! Couldn't have had a better experience. We rented a bounce house (rocket ship), tables and chairs for my son's b-day party. Everything was clean, in perfect condition and delivered exactly when I requested. The two delivery men were polite, helpful and very efficient. I needed to change my order 3 times right up until the day before the party and Magic Jump accommodated my requests with no problem. Great, friendly, smart customer service. They called to confirm the day before and sent confirmation email with all details every time I made a change. The price was very reasonable and competitive w/ other companies we researched and their web site was very easy to use. Would definitely use Magic Jump again and highly recommend them. Be forewarned that they pick up promptly and quietly. We were all inside the house when Magic Jump came to pick up in their unmarked white van. (We had the magic jump set up in our front yard.) They didn't even knock on the door or give us any warning that they were taking it away. We just came out in time to see the white van driving away. All in all, we were very pleased with Magic Jump and will definitely use the again. Just wish we had seen the $10 off code on Yelp before we booked!